Zilla came home from school one day with a bugs in a bag. Of course he didn't tell me about it until hours after they arrived. The poor things somehow survived. Zilla asked for a jar and asked why he wanted it. When he told me it was for a bug I thought he had something small like a firefly. 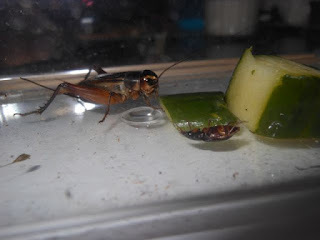 Thankfully over summer I had picked up a bug box at the 100 yen store as this cricket would not have been happy in a small jar! The cricket became the centerpiece of our table. We had a very interesting time of observation and discussion. I realized how different the world is for my kids as we googled the Japanese name of the bug, and then the English, to learn all about it. 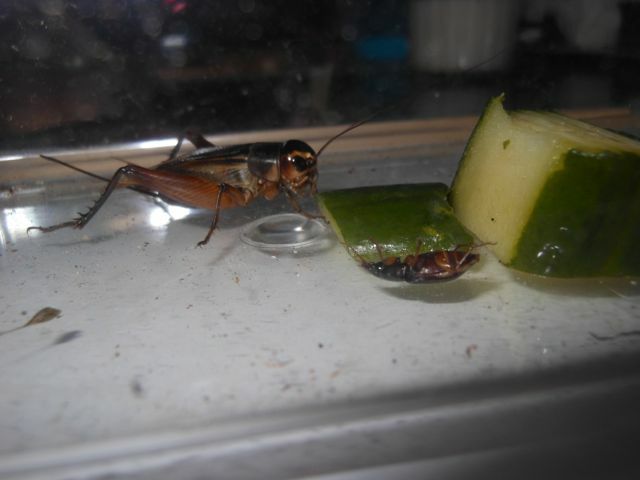 Some things though are best observed in person so we watched as it enjoyed eating some cucumber. Thankfully Zilla was off at school the next day when the big bug decided it was time to eat his little friends. Zilla came home to one less bug in the box and declared that the cricket must be an omnivore. Did I know the meaning of that word when I was 4 years old? Another accomplishment has come in the communication and tolerance that Zilla and Mega have for each other. They have always gotten along but increasingly they are learning to listen to each other and do things for each other. It has been pretty much one sided so far (Zilla accommodating Mega) so it is nice to see their relationship become more balanced. 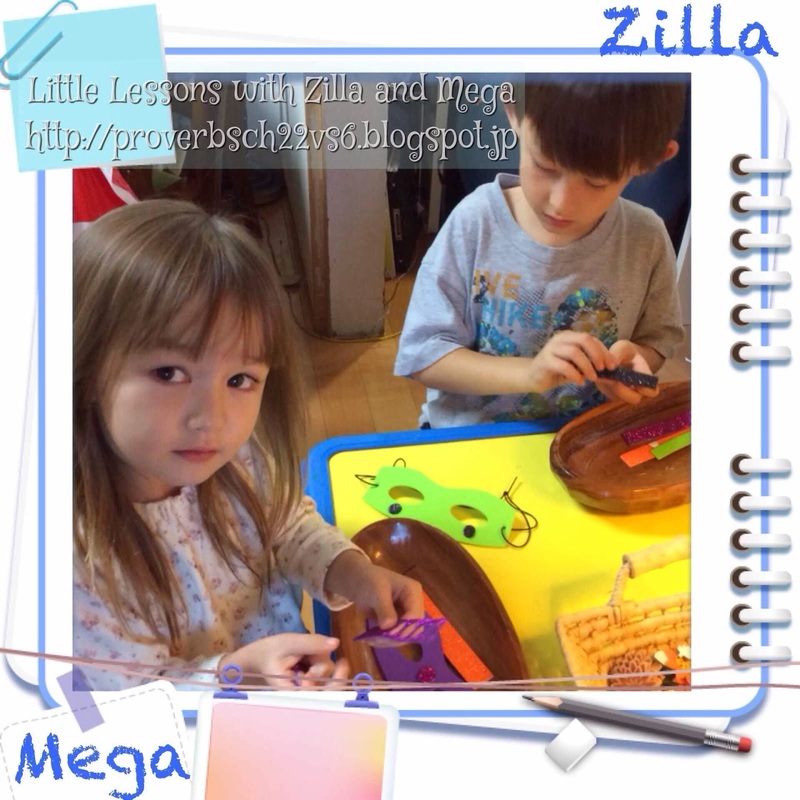 In this picture Zilla had been drawing some things and Mega came over asking to draw too. She wanted a blue paper, the same as him so since he had just finished his picture so he asked Meg if he could draw something for her. 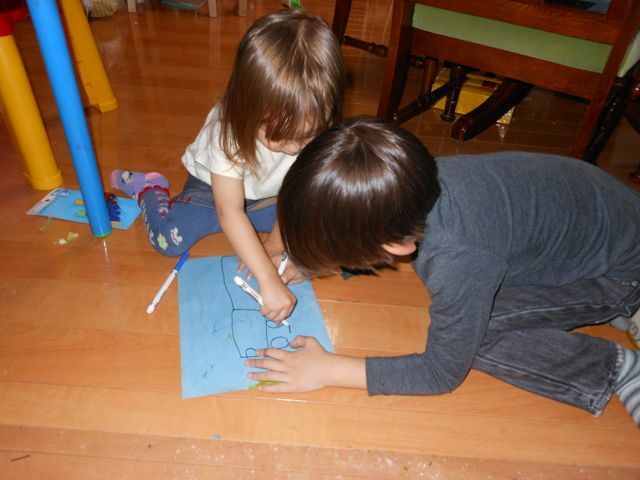 He's drawing a steam engine and she is coloring it in. The peace between them didn't last for long (maybe 10 minutes?) but it is a great start! This week we will once again be running as a single parent household as my husband travels for work. 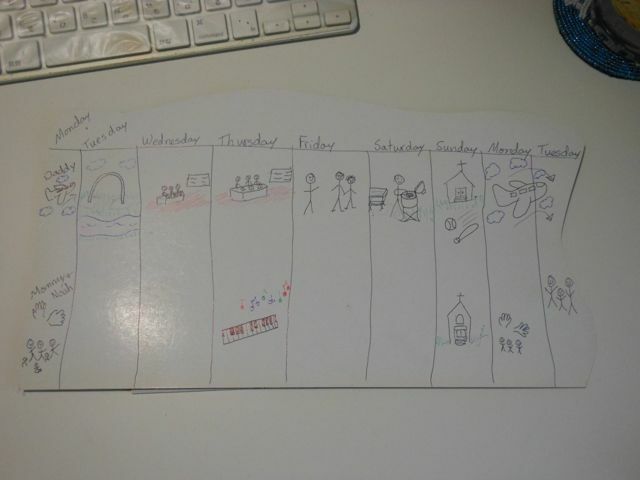 In recent cleaning/organizing I came across these picture calendars I made for Zilla when Daddy was on business trips a couple of years ago. They really helped him to understand what was going on. 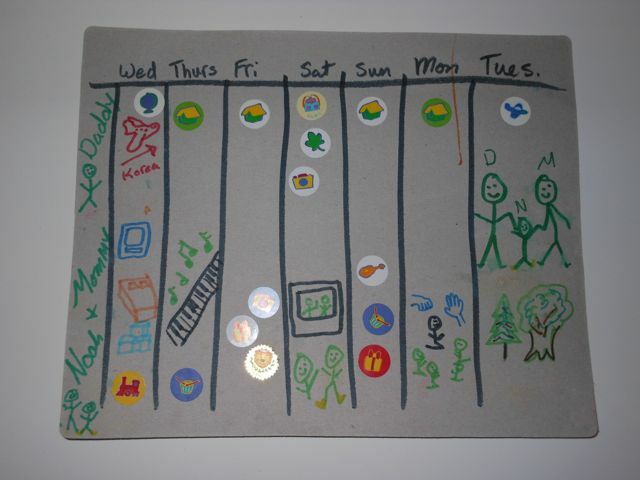 The top row is Daddy's daily schedule and the bottom row is ours. I think we're going to have to make a picture calendar for this week too. Mega, especially, has little concept of time so I hope it will work as well for her as it did when Zilla was 2!